Blackheads and whiteheads, known as comedones, can be more numerous on the face and shoulders than red bumps filled with pus. 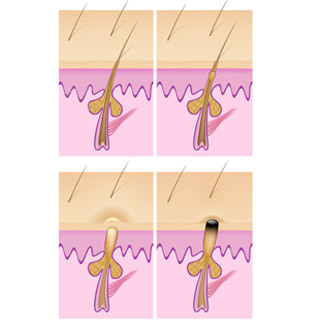 Blackheads, also known as open comedones, are follicles that have a wider than normal opening. They are filled with plugs of sebum and sloughed-off cells and have undergone a chemical reaction resulting in the oxidation of melanin. This gives the material in the follicle the typical black color. A blackhead can develop into a pimple or otherwise known as papule or pustule. Whiteheads, also known as closed comedones, are follicles that are filled with the same material, but have only a microscopic opening to the skin surface. Since the air cannot reach the follicle, the material is not oxidized, and remains white. The recommended treatments depend on various factors (social downtime, urgency to address concerns and budget)and will be discussed during consultation.